Who needs a selfie stick, when you can just Selfie Stick-It to the wall? Most people would be content after bringing an innovation — nay a phenomena — like the selfie stick into the world. Most would hang up their inventing cap, settle down and watch contentedly as millions of tourists around the world raise their selfie sticks to the sky almost as if to salute their ingenuity. But the Canadian who pioneered the selfie stick, Wayne Fromm, has refused to tame his inventive mind. In a bold move, his company Fromm Works has revealed the Selfie Stick-It, a hands-free mobile photography gadget that represents the next logical evolution in mobile photography accessories. 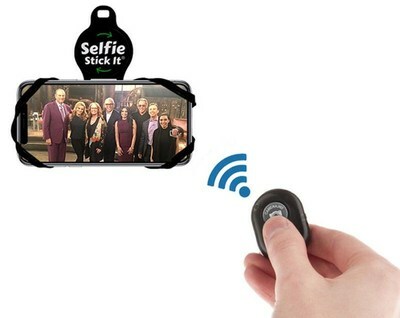 It comes with a Bluetooth remote to facilitate the hands-free capture and is currently available at selfiestickit.ca as well as on Amazon.ca. If your main take-away from all of this is a shocked sense of pride (and/or shame) that a Canadian had a hand in the selfie stick craze, here’s a little background for you. While homemade selfie sticks date back to the early 20th century, in the modern digital era Fromm is frequently cited as the first to launch the hand-held monopod product that came to be known colloquially as a selfie stick. He brought the ‘Quik Pod’ to market in 2006. Of course, others can also be credited with building on the product’s success. Still, there’s no doubt that Fromm was a selfie stick pioneer. This latest innovation is a collaboration between the Canadian inventor and his daughter, Sage Fromm. The duo took their new innovation to the Dragon’s Den not long ago where they — in their own words — “stuck it to the Dragons.” You can find that in full-length here.